Posted By: Godot Date: 7/11/13 3:06 a.m.
Yesss.... dead Bob scenery items are back! 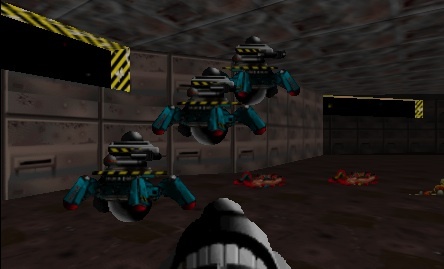 Missing from M1A1 (for some odd reason) these mangled corpses add atmosphere to this level. How? Well if you are playing this for the first time and you are genuinely trying to keep each Bob alive then finding these dead bodies is like... WTF... who did this? "They killed Bob! Those bastards!" Where's Dr Sumner when you need him? MADDS have a tendency to cluster or stack even in wide open areas. See pic below. This makes them ineffective, thus making saving enough Bobs even harder. Dual pistols rule. As GK says... Never Stop Firing. Beta test: The Rose Godot 7/11/13 3:06 a.m.
Re: Beet test: The Rose President People 7/11/13 7:56 a.m.
Re: Beet test: The Rose President People 7/11/13 8:05 a.m.
Re: Beet test: The Rose Godot 7/11/13 8:20 a.m.
Re: Beet test: The Rose Martin 7/11/13 10:40 a.m.
Re: Beet test: The Rose Godot 7/11/13 11:09 a.m.
Re: Beet test: The Rose President People 7/11/13 11:43 a.m.
Re: Beet test: The Rose Godot 7/11/13 11:59 a.m.